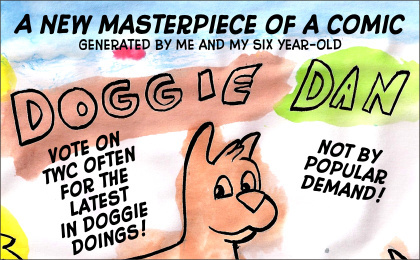 A NEW VOTING INCENTIVE COMIC (generated by me and my six year-old daughter)!!! In all seriousness, this comic does touch on a common misconception that I hear people spouting all the time. Folks tend to think karma functions like some sort of divine retribution, punishing the wicked and rewarding the good. And it does. It’s just a very delayed process. If you’re wicked, you might come back in your next life as a spider or something. But it’s not going to happen in this life. There’s really no major world religion that promises rewards in this life for good deeds. No one’s bold enough to make that claim because of the plentiful evidence to the contrary. And hey, look! More plot happened! Fancy that! They’re lucky that they didn’t get sent to the Phantom Zone. FINALLY!!! Someone who get’s that aspect of karma! Thank you! It’s good to know. No one wants to come back as a mollusk. I was thinking that the other day as I ate a whole plate of them. Do you know the grocery stores sell plates of frozen, buttered snails for, like, five bucks? It’s magical. Escargot really are just like eating sponges for butter. But I’m down with that. My dad once tried to get me to taste escargot, and I’m really glad I refused. Why? Best case scenario, I don’t like it. Worst case scenario, I like it, and am forced to question all my choices in life. Over-dramatic? Yes, but hey! It’s my excuse and I’m sticking to it. Do they taste like tiny french chicken wings? Everything tastes like chicken. Except snails. the one time I tried them, frogs’ legs taste like tiny chicken wings, but snails tasted and felt like rubber. Did I mention that I love frog’s legs too? I love frog’s legs. They’re like the flavor of an entire chicken compacted into a tiny little piece of meat. For a second I was imagining a Human Being would eat those. No, no even in Canada. Colossal Squids are molluscs too, y’know. Side note, my grandmother always taught me that Karma comes around about five years after your deed. What if your Lifespan is, like, 15 years, tops ? That is NOT adhering to any actual belief system I know of. But your grandmother has a right to create her own. It’s because of Sylvia Brown. My grandma loves the fraud. I was about to say the same thing. No one portrays karma as part of reincarnation anymore, it’s just “Do good things and good things will happen to you” these days. Maybe we need to differentiate it from the religious concept of karma. It’s western pseudo-karma. We’ll call it korma! See? Doesn’t it sound delicious? I was going to reflect on the fact that Daphne’s knowledge of religion is pretty good for her age, but got distracted by the question whether “Ye Olde Clink” has an “e” on the end. I think you’re right there. I assume she has a fairly strong basic knowledge of all things, if only to deride and mock them. I actually did not put an ‘e’ on the end. A missed opportunity, to be sure. Thanks for the public service on karma. My primary goal with this comic is, after all, education. You mean I won’t turn into a spider next week? Pfft! And here I am doing all this evil for nothin’. screw how they ended up in the slammer, i want to FINALLY know what the heck she needed that smurf for! A lot of people that I know of (including in my family) says “do good and good will happen to you – it’s called Karma”. …I’m then told I’m wrong and an idiot. Thanks for being someone who understands how Karma *really* works. Skipping stuff between panels 3 and 4… To be honest, I find it funnier this way – you expect everything to go well and “oh hey. They’re behind bars. Whoops?” happens instead. Yeah, speaking personally, I’m with you. Any of the ‘you’ll get rewarded for good deeds in your next life/afterlife’ concepts sound way too reassuring to be true. I’m honestly a bit more Confucian in my world view than anything else. His main idea was basically, “Uh, guys, let’s stop worrying about this ‘next life’ stuff and start working on making this life marginally better by cooperating as a society.” But I understand that people don’t find that terribly reassuring. Sounds greedy. The only reason to live is so people will treat you good because you’re good. Too much mafioso. Daphne in lock up for being an arsonist, her precious baby missing because of her brain dead boyfriend and her best friend puking all over her multiple times??? This would be a good time for everyone to get the hell out of Funderland because this is gonna get UGLY !!! But why run away when things are just starting to get interesting? Somehow it’s comforting to know that the universe these guys live in does have a jail, after all. I don’t think it’s a real jail. Most real jails aren’t themed. Daphne and Wilbur will just have to make do. Doesn’t Canada have a Fourth Amendment equivalent (to be secure in your papers/travels – search and seizure, etc)? How would they know she had a Snorf without a warrant to search her bag? Somebody correct me if I’m wrong, but I’m pretty sure a bill was recently passed that allows police to search without warrant if there is suspected terrorism (it’s an anti-terrorism bill). If they viewed this as an act of terrorism then I’m pretty sure they would have every right to search her, unfortunately. Shnorfs are, I think, not that important to national security. There is a difference between criminal actions and terroristic behavior. Yes, but the police can twist it and say they thought it was an act of terrorism. Until they found the Schnorf, of course, then they would know it was just criminal actions. I don’t know, but I’m guessing the security video footage might be a little condemning. I forget video camera exist. It’s probably a good thing I’m not a cat burglar in real life. I don’t know whether Funderland does this. Probably. Let’s retcon that and say they do. Retconderland has a lot of fun rides, all of them confusing. I’m glad you skipped all the ‘fun’ of Daphne and Tyler getting caught. Honestly, this is more humorous, and I feel like showing it all would just make it a bit too long and drawn out. In my opinion, this is much better for the story arc and the humour. But who wants to use imagination now? The whole idea of the internet is that imagination is now obsolete! This whole story arc is too long already. Any place I can speed things up, I will. Speed pass with the ride lines, free quarters for the toll roads and doubling the damn speed limits on the roads. On the upside? No hqving to live with a life of crushing guilt after the media report the hideous, fiery death of a toddler or toddlers in the inferno that was once the Schnorf Village. Well, there’s that. And that does have value. Poor Laurel. Always so gullible and well-meaning. The comparison is apt. Puck will not be thrilled to have to bail Tyler and Dap out of jail. It’s like the finale of Seinfeld. Who puts men and women in the same cell? Well, I don’t think this is a real jail. But yeah, I totally reserve the right to poetic license in the depiction of all highly inaccurate things contained in this comic. Theme parks that use a detention cell to hold people a couple of hours until the real police arrive. A single cell under constant guard for 2 hours isn’t likely to see any funny business. How about having Dap and Tyler use Zen to relax while waiting for Puck to bail them out of jail. There is absolutely no other way this incident could have gone (knowing all the parties involved) and yet I still found this hilarious. Thanks. Sometimes the stuff writes itself. Wait a minute, if that’s a make believe jail, why can’t they post make believe bail and get the schnorf out of there? I mean, really, it’s probably plywood with paper-mache bars. Well, it’s reasonably sturdy make-believe. And I’m sure there’s a security guard close by. But I’m thinking if you built up enough speed, you might be able to Hulk your way through that fake concrete wall. Well, you’re right in that a number of the protestant wings of Christianity flirt with this idea. And religious Americans in the 1% love this concept too. I would say it’s a very popular concept, especially in the American psyche, especially right now. Few religions take the step of turning it into official policy, though. They hint at it, allude to it, but don’t turn it into official doctrine. Causality is where it is at. Karen kanned the kat (sob sob sob). Hollered at me, too. Brayed my observations weren’t on point, weren’t funny, weren’t even original. Time to visit the Unemployment Office – again. I still hold out hope for you, though. Your unrestrained profanity just may be the Key to Karen’s heart ! A TIP: Sit at your Monitor, with a grimace, whiskey on your breath, unshaved, unwashed, and with Daphne on the screen. Mutter constantly, with frequent, violent, spit-laden outbursts of foul maledictions, combined with unrestrained gesticulations, and a bright future will be secure ! You know raising the alarm is sufficient help, given the park has adequite fire fighting capabilities. I know it’s not the joke, but in my head, they got detained for trying to “help” and the Shnorf was discovered by complete accident. But for two ill-informed decisions.